The following letters are a sampling of comments and notes taken from volunteers who have traveled to Limbé to contribute and who have learned valuable lessons in the process. I would personally like to thank the rugby community, family, and friends who contributed to the GOFUNDME fund raising campaign. The trip would not have happened if not for your generosity. My experience was enriching and empowering. I am so fortunate to have the opportunity to help grow the game of rugby in Haiti. Growing the game is a goal of Budd Bay Rugby! And it has always driven me to broaden my knowledge of the game, and of people, as it pertains to coaching rugby. Thank You Budd Bay Rugby Club for appointing me as ambassador of the Club. I held the Club in high regard and was proud to wear our color abroad. I was honored to be reunited with my great friend, fellow rugby coach, and founder and director of Helping Hands Noramise, Rosedanie Cadet. Her motivation, gen and guidance throughout the whole trip was not only imperative, but also very inspiring. Thank you Helping Hands for allowing me access and platform to teach rugby. Having learned a handful of Creole rugby terms, and having the courage to use this fresh new language, I believe we were successful in teaching; passing and handling skills, basic defensive tracking/ organization, decision making in attack, kicking skills, and going forward in attack. The Camp ended with a game of touch rugby. 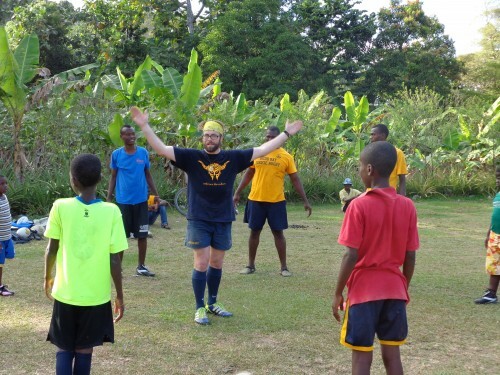 Although teaching rugby skills was the primary objective, which was achieved, I believe the real benefit of developing rugby in Haiti….is what is can do for these young men’s morale and perception of brighter days ahead! As I began to get to know the individual players, it was plain to see the joy and excitement of learning something new and being apart of a team. Rugby is such a team sport. As the the principles of the the game begin to set in, it can serve as a great launching point into a positive direction, for a young athlete approaching adulthood into an unforgiving world. A quick back-of-the-envelope calculation revealed that it had taken us four hours to drive 36 miles. This sinuous, cratered section of road between Gonaïves and Cap-Haïtien, two of Haiti’s largest cities, crested mountain passes, crossed plains, and skirted roaring rivers, testing both our driving skills and our nerves during the long trek from Port-au-Prince to Noramise’s Limbé center just outside of Cap-Haïtien. Countless near misses with colorful passenger-laden tap-taps, loose goats, and potholes that could swallow a small van without a second thought (which had a nasty habit of sneaking up without warning) had left us white-knuckled and exhausted by the time we pulled into Limbé late in the sweltering tropical October afternoon. At the invitation of Noramise’s director, Rosedanie Cadet, my colleague Eric and I had just journeyed across Haiti with the intent of exploring opportunities for collaboration between Noramise and our organization Carbon Roots. Rosedanie had generously offered us the hospitality of Noramise’s center while we learned about her organization’s work and explored the lush north Haitian countryside. The center also happened to be the ideal place to recover from our arduous expedition across Haiti. Upon arrival in Limbé, Lunise and Irose Joseph, the center’s caretakers, quickly and ably took on the role of hosts and welcomed our weary bodies into the center with open arms. Pulling our battle-worn Jeep into the driveway, we heaved a sigh of relief as we unloaded our gear onto the center’s grassy front lawn. Our tour of the center hadn’t even finished before Lunise offered us delicious homemade cinnamon cracker-like snacks, which we immediately identified as our new favorite Haitian food. Our next surprise (and as those who have been to Haiti can attest is truly a treat), we were given hot water for bathing. Hot water! Here was a small luxury that one goes weeks – months – in Haiti without experiencing, and we could indulge in this much-needed lapse in “roughing it” at the end of the day we needed it most. We were already beyond content at Noramise’s center. After a solid night’s sleep under the protection of mosquito nets we were sufficiently rejuvenated to wander the grounds as Lunise and Irose told us about the inspiring work Noramise does within the Limbé community. Irose proudly presented artwork hung on the walls, painted by the children who visit the center after school. We listened with great interest as Lunise showed us their compost pile and the small plot growing native fruits and vegetables, where locals were taught sustainable gardening techniques. Here was the opportunity that Eric and I had been looking for: the potential for a collaborative project between Noramise and Carbon Roots. We could teach Noramise about additional sustainable agriculture techniques in their urban garden, while Noramise provides Carbon Roots with the opportunity to expand our reach and interact with people in northern Haiti. That evening the four of us eagerly discussed what a future relationship between our two organizations might entail, the enthusiasm of Lunise and Irose evident as they expressed their passion for empowering their fellow Haitians. Carbon Roots had found important partners in Noramise, at the end of our long journey north. The next morning, after some unanticipated car repairs and some friendly goodbyes, we hit the winding road again on our long drive south to Port-au-Prince. This time a little more comforted, knowing the upcoming hairpin turns and knowing that not all in Haiti is chaos: there are passionate people across this beautiful country, working together for the betterment of their community. Greetings! And thank you for your interest in Helping Hands Noramise. Helping Hands Noramise (HHN) is a hands-on organization that is committed to the future of Haiti and the empowerment of its people. HHN is partnered by and highly integrated with local and international individuals and agencies to help develop and sustain such programs including waste management, aquaculture, farm and garden development, education, cultural enrichment, and more. In June 2011, I made my first trip to Haiti to see what HHN is doing first hand. I spent my first week in Haiti around Port au Prince, interviewing engineers and medical personnel. I was performing site checks and interviews all over the southern part of Haiti. By the time I flew up to Cap Haitien and then was driven to Limbe (where HHN is based) I was exhausted, and feeling a little under the weather. The HHN staff was incredible and took very good care of me, served up an amazing and large meal, and had their staff nurse keep an eye on me. Needless to say, I slept extremely well that night. The next morning wandering the beautiful grounds HHN is built on—with local artwork hanging everywhere—I was generally impressed by the way they are utilizing their own land. The large tilled garden had citrus and banana trees bearing some of the best fruit and juice around, plus hardwood trees that may be able to be used as lumber for future construction projects. There is also a wonderfully functional rainwater catchment system plumbed into the house for running water by a pump and elevated cistern on the roof. I would love to see every dwelling in Haiti use a similar system. HHN is serving its community in a wide variety of wonderful ways, including the most important of all, leadership by example. I stayed here for over a week and took day trips to interview doctors and see facilities in the northern part of the country. None of this would have been possible without Jimmy, HHN’s staff driver, who was indispensable to me. His extensive knowledge, experience and ability to translate and interpret made the logistical challenges much easier. And his 4×4 with air conditioning was a wonderful reprieve from the heat. My time at HHN headquarters in Limbe was amazing. I was fortunate enough to see some of the daily inner workings of this terrific organization. There were different children’s groups doing arts and crafts projects, singing, and general bonding in cultural and dynamic ways. Some of the kids’ groups are led by local popular radio personalities who are vested in the future of these wonderful children and their families. I would unreservedly recommend a visit to learn more, and doing what you can do to get involved or support HHN. A person can make a lot of friends there, and come to a closer understanding of the wonder, beauty, and struggles of this fascinating and enduring nation. The journey for me began in September. It was then that I decided to travel to Haiti and volunteer for my senior project. I wanted to experience a new culture and help a group of people less fortunate than I am. Intuitively, I felt Haiti would be the perfect place for this experience, and then the earthquake hit. I wasn’t sure if I would still be able to go, but, fortunately, I learned about Noramise. Because of this serendipitous connection, my father and I were able to travel to Haiti with Noramise a month after the earthquake to help get the project up and running. We talked with community leaders explaining the purpose of our project, visited potential sites for the food processing plant, and worked with local community members motivated in bettering the town in various ways. In addition to participating in these activities, another job I had was documenting our experience, and after returning home I created a slideshow that was used in some of the presentations to the Orcas community. I was thrilled to get the chance to travel to Haiti, but in hindsight, I didn’t fully comprehend what was in store for me. Even though I had studied Haiti’s history and culture, I still wasn’t fully prepared to experience the culture firsthand. This realization occurred to me as we drove into the remote town of Limbé. Rosedanie sat in the passenger seat and y dad and I sat on our five large totes of supplies in the back of the old pick up truck as we drove slowly through the narrow market streets of Limbé. The driver was honking every five seconds to get the people out of the way. Our grand entrance was the last thing I wanted to experience. I felt like I was on the back of a large, ostentatious float in the middle of some parade, not sitting in the back of a small, battered pick-up truck. As we drove through the market place, everyone stopped and stared. We were the spectacle because we were two white Americans, or “Les Blancs” as the Haitians called us. Our arrival may have been the most extreme culture shock I faced, but I encountered new sites and situations every day. Additionally, I have never been the minority like I was in Haiti. My dad and I were basically the only two Caucasians in Limbé at the time. As much as I tried to look past this, it was quite intimidating, and that is why the staring was uncomfortable for me; it reminded me I was in a culture that was completely foreign to me. After a few days though, I was able to overcome my feelings of intimidation and appreciate the trip as a learning experience. By the end, I didn’t feel nearly as uncomfortable as I had the first day. I met a young man named Lumil who spoke some English and Spanish so we could communicate, and he actually became a good friend while I was there. I also taught some young kids the basics of “American” football and played basketball with some of the guys my age. I believe the game of basketball the last night I was there illustrates the acculturation progress I made while I was down there. The first day, driving through the market, I could hardly handle the staring; however, that final day as I played basketball, the player I was guarding taunted me partly because I was the only “white” guy out there, but it didn’t affect me. I realized that he was simply having fun and meant no harm in teasing me. I just considered myself another player on the court and tried to enjoy the game. I had grown to be comfortable in the foreign environment and I also knew they had grown to feel the same way towards me. The relationships I made in Haiti were what helped me become more relaxed in the initially strange culture. I think of Lumil’s brother. Like me, he is a young man who enjoys intellectual challenge. He wants to become either a doctor or a lawyer, but all the colleges he was considering attending were destroyed in the earthquake. I think of Lumil who is currently stuck in Haiti and unable to return to his physical therapy school in Cuba. I think of all the people of Limbé who spend there day in the muddy market place near the immense mound of waste. These people now mean so much to me because the relationships I made in Haiti allow me to understand and relate with them now. Through my work with Noramise and these relationships, I feel sense of connection to Limbé now. I would like to return to Limbé and continue my work with the Noramise Project. And, reflecting on my experience, I truly believe that the connections are what are important. The stronger the tie between Orcas and Haiti, I feel that the more both islands will grow and progress. Hello world community. I am Annie Jordan. I have spent more than fifteen years in the social justice, cross-cultural reconciliation, self-sufficient ecological and community-building nonprofit worlds in the U.S. and abroad, specifically Central American and Caribbean nations. My research threads the realm of bridging and building collaborative community in traumatized areas. Finding a bridge between personal wants and honoring a specific culture is a delicate enterprise. There can be unforeseen effects, such as re-oppressing the culture despite the best intentions. I arrived in Limbé in March 2010, a few weeks into HHN’s initial venture, as part of a documentary team. It is imperative for any enterprise aimed at building community, especially across cultures, to know the intent. Self-reflection and conscious acknowledgement of personal wants are crucial abilities for HHN now and going forward. Without such awareness, decisions and actions made by HHN carry the potential to re-traumatize vulnerable persons and environments. Many believe the earth quaked and laid bare the historical and ancestral wounds from centuries of psychological, ecological, political, religious and economic oppression against Haiti. What I witnessed in HHN was a burgeoning awareness of meeting more than the wounds in Limbé. I was impressed by HHN’s outreach to diverse groups and individuals, discovering their wants and needs. In this action, HHN stepped back from their initial push to create a seed-saving program. They were then able to match their personal skills with the town’s needs, such as addressing the market built on a mountain of trash. I witnessed the transformation of HHN’s hermeneutic driver, Jimmy, into their town mediator and collaborative partner. This act exemplified HHN’s capacity for self-reflection in a continuous endeavor to microscopically build a global community. I am hopeful that HHN’s actions will tend Limbé’s spirit and connect the diverse community of artists, farmers, market vendors, teachers, church members and politicians. I find myself particularly grateful for the above quote, as it so hauntingly captures the complexities of our work in Haiti. When I returned from there in March of this year I felt an uneasiness I could not quite identify. Here in the U.S., with our garages and street corners overflowing with consumer goods, it seems logical to just take some of our atrocious wealth and give it to those in need. But the reality is not so simple. Like in the analogy above, effort can be made to “pull children out of the river” by feeding empty bellies, but effort also needs to be made upstream, at the root cause. And any sane person would have anxiety trying to choose between those options. When hand-outs are constantly given to people, it can weaken them. Rice comes in and rice farmers are forced to the bottom of the market. Clothes are donated and tailors go out of business. Disaster happens physically, and then disaster happens economically in the flood of foreign supplies. Historically in Haiti, aid comes in one hand and corruption and violence with the other. Then aid becomes an accomplice of imperialism. What is a well-intentioned activist to do? In a booklet on sustainable aid by permaculturist Robyn Francis, a guideline is laid out as the table below. Many of the lessons that Helping Hands Noramise (HHN) has been through in this first year are what I would call growing pains toward achieving effectiveness. I for one thought it would be much simpler to help on HHN’s mission of empowerment than it seemed. The whole pattern of aid in Haiti has been working an entirely different way for many generations. So what then does empowerment look like? And what happens when those two patterns intersect? Well, we’ve learned what not to do. We were partially successful in putting in gardens; it was great fun for us and the Limbé community. But many of those gardens washed out. We did not have the skills to talk about hydrology and organic matter and community patterns. We were partially successful in giving seeds to gardeners; it built a lot of camaraderie. But we fear that seeds from these plants will not be saved and spread throughout the community. Again we lacked the communication to learn about harvesting and seed-saving techniques. We were partially successful in cleaning up the trash pile in the center of town; it helped with an immediate sanitation crisis. But it’s counter-intuitive to ask people to sort through garbage in a country with such a health catastrophe. So we haven’t quite failed. And the glaring answer I see to all of the above is that more of the North American team needs to dedicate themselves to learning Creole. If you’re mulling it over let me assure you how fun it is: no verb conjugations! And on the other side, it would be wonderful if our Haitian team could put more energy into culturally mentoring those who go to Limbé. Make a curriculum for us on how the town works, how the children grow up, what resources get wasted. We are eager to know. Without this reaching out on both sides, our work will never get as rewarding as it could. HHN’s alliance with many great projects and leaders in Limbé gives me hope. Let us give resources and supplies to Delanoux and the Farmer’s Association. Let us give strength to Danise and the Women’s Association. Let us share fun times with Irlande and the Youth Group Activists. Let us get creative with Tambour Creole, the artist’s collective. Let us back up Rosedanie whenever she speaks truth to power. And let us learn how to forgive one another when we blunder, and to be affected by not just giving but receiving as well. I want to take this opportunity to thank everyone at HHN for making my and Richard’s trip possible to Limbé, Haiti, in August and September 2010. The trip was a success and it is one that I will remember forever. Prior to traveling to Haiti, I received unwelcome grief from friends and family. Haiti is not a place known for its tropical vegetation and beautiful beaches. And this was reflected in the comments from many people. Richard and I have traveled enough to know that there is good and bad to every location in the world. And right upon arrival we found plenty of good to connect us with Haiti. First, HHN made the trip as fluid as possible. We arrived on Thursday August 12, 2010, to Santa Domingo where a partner organization, Sister Island Project, picked us up from the airport. We spent a relaxing night in the Dominican Republic, got a nice warm meal and then caught the early Caribe Tours bus to Cap Haitian, Haiti. And they even fed us on the bus! Once crossing the border into Haiti from DR the situation changes rapidly. The road goes from a vast desert land in DR to a lush lowland green in north-east Haiti. You are whisked through small villages, each with their own wares for sale by the street. We pulled into the bus station where we met Mr. Jimmy Ulysse. Little did we know how crucial this individual was to our work in Haiti. Jimmy gave us a good tour of Cap Haitian, took us to a nice restaurant and put us in our hotel for the night. The next morning Richard and I had not realized the one-hour time change (EST) and were floored by Jimmy’s eagerness to work. He showed up more than one hour early. As we set off to our new home in Limbé we honestly didn’t know what to expect. We came down the mountain, over the bridge and into Limbé proper. Just a few minutes off the main road and we were welcomed by Sister Irose and Lunise at the Helping Hands Noramise house. As we settled in at HHN we were bombarded by an onslaught of visitors. Everybody wanted to see the new Noramise team and figure out what we were up to. It was quite overwhelming at first even though their interest was genuine. Everyone in Limbé has their own projects and they were anxious to see what our focus would be. After a few days of settling in we set back off to Cap Haitian (Okap) for electrical supplies. Going to Sogebank became all too much of a routine to get my withdrawal in U.S. dollars. To my dismay all the local vendors wanted us to buy their expensive imported goods in USD. It just eliminates another currency exchange before they buy more goods from overseas. We made a concerted effort to do our best comparative shopping. We ran Jimmy up, down, left and right all day long. After a small temper tantrum I accepted the fact that there is a limited variety of goods, very limited amount of suppliers and the price is pretty much set. If we looked really hard we may find a 10% difference on $1000 worth of supplies but after factoring in the $70 tank of gasoline we used to run around all day, is it really worth it? It’s probably best to build a relationship with one importer/store-owner and leverage your discount on large purchases through them. Next on our list was internet. Richard learned that both Voila and Digicel have data networks that our iPhones could tap. At about $30 each per month we decided to get both plans to have some redundancy at the house with internet. The other option is to buy the $140 USB cellular modem and a monthly recurring plan at $45. The router should be bought in the US for about $50. That will make the house wireless for everybody. The only internet outfit in town is right across from Unibank and the connection is pretty slow. The internet may not be any faster over the data network but you can be browsing from the comfort of your own home and not having to pay the roughly 50 Gourdes per hour. And this was definitely a big hit among all our visitors. “Do you have internet?” was a very popular question once we were up and running. Internet is the fastest connection to the world and laptops contain a lot of personal information of the owner. We would highly recommend the next HHN team taking a cheap disposable laptop for the community to use. One area we were not satisfied with was the bunk beds for the house. Ms Grimard brought the head of the local carpenter group to our house and we got a quote of about $2000 for the oak furniture. It seemed a bit excessive and there are many outfits in Limbé that we highly recommend speaking with to get additional quotes. Most people wanted money up front to buy the material before they commenced with the work so just be sure to withhold a reasonable amount for labor until the end of the project. On a lighter note, the HHN house has immense possibilities. The bedrooms are plenty large to accommodate 5-6 teachers and there is ample space with the office and dining area to host two meetings of 5-8 people simultaneously. The garden space is a wonderful escape from the confines of the house and the activity on the street. The options are endless for this space. As discussed, you can commence classes and even art shows in the back of the house. The razor wire is also now complete around the house. This should preclude the ambitions of anyone wanting to enter the property after hours. There are people living on both sides of the house and the lights are on in the hospital to the rear of the house every night. As with any security system it can be circumvented with enough effort. Another step to consider may be to place dowel rods to support the razor wire at its highest point. This can been seen at the UN base and most government facilities in Okap. Also if HHN intends on placing several foreign teachers in the property, we would highly recommend placing a male security guard at the gate to deter any people from entering the property. Now that we had put up the electrical inverter system, with Willie’s extensive help I need to add, we could rest easy with power for the phones, laptops and night lights. There is nothing Americans need more than power. And we were soon to find out how popular it is in Limbé as well. EDH put power on most nights from midnight to 4:00 a.m. We placed a red light in the living room so we would know when the town power was on. We could also then go check that the inverter/charger was re-charging our DC battery bank. Just make sure the LED display reads 70A and you are fine. The lights at the front of the house were an indication to neighbors that they could charge their phones at our house as well. So we were more apt to meet the neighbors. We simply placed a few chairs on the front porch and let them use the outlet there to do their laptop work and/or charge their phones. And finally on to the hospitality we received in Limbé. Willie was never more than a phone call away. Jimmy stopped in every day to check on us, and Lunise and Sister Irose, well they deserve their own praises. Lunise worked harder than anyone I can recall. She was off in the morning to get our fresh pineapple, eggs and juice. And the coffee was ready with sugar on the table most mornings before I woke up. Not long after breakfast when Richard and I were settling into our computer working positions, Lunise was off to the market again. She came back with the most abundant array of food I have seen in some time. We would have crabs, beef, legumes, corn bake, pasta and fresh-squeezed juice as a minimum for dinner. I have not had five-dish proper meals in a long time and I could not believe we were having them in Haiti. We had an understanding that the money we were paying for food should feed the four of us breakfast and maybe 2-3 extra guests everyday for dinner. She would squeeze every ounce of juice out of the lemons to make sure that everyone got their share. She even got ice to put in our juice, need I say more. No matter how many people showed up for dinner Lunise made it possible for everyone to get enough. I didn’t mean to impose my cultural norms on the people of Haiti but I made it a point that everyone who sat at the HHN dinner table was truly thankful for the amazing work Lunise was performing in the kitchen. Our work would not have been possible without her stellar efforts keeping us well fed and full of energy. Sister Irose also made a large impact on Richard and me. Within the first week she was sitting down with me in the evenings and going over the French flashcards we brought. And she didn’t accept my half hearted attempt at speaking French. There is a proper way to speak and she was going to make sure I knew it. Her positive attitude after returning from church in the evenings was infectious and she made the place feel like home for all of us. The work of everyone in Limbé and on Orcas Island made this trip possible. A few short months ago I was speaking to my friend Kathy here in Baltimore and she told me of this organization she so wanted to go to Haiti with. After a few conversations with Rosedanie, I was on a plane to Washington to meet this unique group of individuals making a difference in Haiti. After visiting HHN in Orcas and hearing the stories of the people who had just returned from Limbé, there was no doubt left in my mind who we would be working with. Richard and I want to extend our heartfelt gratitude to all those who made this dream possible to touch the lives of those in Haiti and to be touched by them. Upon my return, the response I have received in my community is overwhelming and it seems your work is more appreciated than you may ever know.